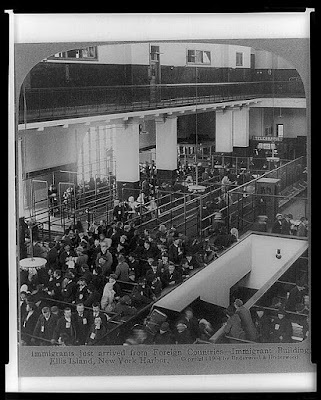 While approximately one in five were detained for the Board of Special Inquiry, only 2% of the 12 million immigrants processed at Ellis Island from 1892 to 1954 were ever deported and sent back to their home countries. The most common exclusion was "Likely Public Charge," taken from the section of law which excludes anyone who might become a burden on the public. Many of these cases were coupled with medical certificates, because it was a medical condition or physical disability which caused officials to think the immigrant would not be able to earn their own living. Three Inspectors sitting on a Board of Special Inquiry would question the immigrant further and decide whether to admit them. Estella Giardino Rosso was given BSI status. But in my grandmother’s case, it was granted as she had a child in the hospital allowing her to continue her stay. The full record (snippets below) shows she arrived on February 20, 1915 and was released to Antonio Rosso on March 5 at 1:15pm after spending a total of 14 days at Ellis Island. Caterina Russo (my aunt Catherine Rosso) is also shown on this BSI listing separately.